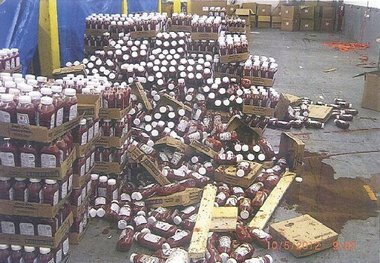 Taking huge, commercial-size bladders of Heinz Ketchup and repackaging it into smaller plastic bottles may not seem like that insidious of a scam, until you think about what else might be getting added to the sweet red goo — and what happens when you leave a few thousand bogus bottles of the stuff in a warehouse unattended. The above photo is the result of one such re-bottling scam discovered in New Jersey earlier this month. Neighbors in the warehouse complained about the stink and the growing number of flies. Inside, authorities found that bottles of ketchup had exploded and decorated the floors with a sticky new paint job. It appears that the ketchup inside the bottles — at least the bottles that didn’t explode — is standard Heinz with high fructose corn syrup, while the bottles are labeled as “Simply Heinz,” which contains sugar and which usually sells at a higher price. A food science professor at Rutgers University tells the Newark Star-Ledger that if some schemer is willing to go through the hassle of putting less-expensive ketchup into higher-priced bottles, who knows what else they could be doing to cut corners. By way of downplaying concerns that the Simply Heinz in your cupboard might be less than legitimate, the ketchup folks believe that most of the product involved in this particular scam had not yet left the warehouse. Heinz is working with the U.S. Food and Drug Administration’s Office of Criminal Investigation to get to the bottom of the matter. The Star-Ledger tracked down the name on the warehouse’s lease, and attempted to reach him by phone, but he apparently hung up each time someone declared they were a reporter.